Wanna talk about Potato Chips? The Little Rascal has struck one last time! On November 11, 2001 Dave and Cheri Petro stepped forward and contacted rescue authorities, saying they believed they located the missing sock and would like to personally apprehend the furry thief themselves. Armed with his trademark furry looks and charm, Zephyr ALA "Little Devil" stole yet another item to add to his Cache-- The Petro's hearts. Hi, it's me, Zephyr. I just wanted to drop you a note to tell you how I'm doing. 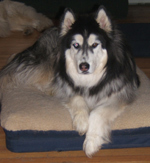 I love my new home and I not only have a human mommy and daddy, I also have a Husky daddy named Jake and a Husky mommy named Nuk-Nuk, a Husky sister named Crystal and a Miniature Fox Wolf Hound Aunt named Annie. They are all taking good care of me and give me lots of kisses (even my aunt). I love it here but it's a lot of hard work; I have to play, and play all day. My new doggy family all takes turns playing with me, but I think I still tire them all out. Besides playing we all practice howling and take lots of naps together. I love napping on top of my new Husky daddy and mommy; I know it makes them feel a lot safer knowing that I am on top of them to protect them. I have lots of toys, and a big yard to run in (boy, do I like to runI must run 100 miles a day!). There are lots of birds, squirrels, and these things called deer here. I love to watch them and sometimes I even chase them. Don't tell anyone, but I was a little scared when I saw my first deer, but my Aunt Annie protected me from them. I know that you would be proud of me, knowing what a good job I'm doing shaping up my new pack. My human mommy and daddy are very proud of me because I am such a good boy. It's like I have been here my whole life; I love it. Anyway, I just wanted to thank you for taking such good care of me and to let you know that I'm very happy and I am with a family I love and who loves me too. Hello to all my friends at TOTT, how are you, its me Zephyr. I hope you and all my puppy friends are doing well. Can you believe its been six months since you help me find my new home! I cant either, it seems like just yesterday that I was at my foster home. Sorry I cant send a picture this time but Daddys camera isnt working. I wish I could though, because I am not that little 20 lb. husky you left here. Would you believe Im over 60 lb. and almost the same size as my Husky Daddy Jake! I never thought I would be this big, but I am and, best of all Im still growing. I really love my new home, my husky mommy Nuk-Nuk and my husky sister Crystal chase me all day, and when they dont Ill bother them until they do. My aunt Annie had to have an operation on her leg so I sat next to her a lot so she would feel better; shes all better now, Im glad. You will be glad to know Im doing well at Husky school, look at my report card Im very proud of it. I know I have to work on Listening but you know how little boy huskys are. My daddy Husky said he didnt do well at listening either. Well its dinner time so I have to go. I hope you are all doing well and thanks again for helping me find my new home. Eclipse first came into rescue in July of 2002, found in a storm drain, afraid of everyone. She started out her foster life at Audrey and Fred's, learning to trust and playing with their 5 dogs. She was adopted in November and returned several months later. Eclipse's quest for a home continues. She went to the foster home of Karen and Eric, where she had fun playing with the 3 resident Sibes. There, she continued to learn to trust people. Eclipse's sad story caught the hearts of David and Cheryl, who have 5 rescued dogs of their own. 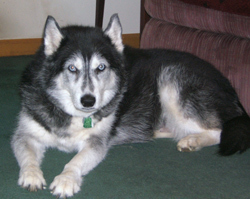 They were seeking a playmate for Zephyr, who was adopted from TOTT in 2001 and the youngest and most playful of all their dogs. But Zephyr has some fears of his own, and needed just the right dog to break through his fears. Enter Eclipse. She quickly snuck into the hearts of the whole family. She loves running in their large yard and napping in the shade under the deck. So on July 8th, Eclipse went home. She is still working on trust, but she already learned that Zephyr will be her playmate and she loves to play bow and bark at him to play. She has claimed her spot on the sofa for naps in between romping with the dogs. It took almost a year, but Eclipse found the perfect home! People who understand her fears, and will take all the time it needs to bring her out of her shell. Way to go, Eekers! I wanted to let you know how well Eclipse is doing with our little pack. I think she is going to surprise us all with how quickly she is going to come out of her shell. The first 2 days went very well. She decided that she likes running full speed down the yard. She constantly nips at Zephyr for him to chase her. That all started the first night she was here. Zephyr is not used to running and being caught so it was quite a shock for him. She tackles him and he rolls over and she lays on top of him and HE LETS HER. He is at this point unable to catch her when she goes full speed. Shell certainly get him in shape. She played with all the others, even old Annie [13 yrs] chased her down the yard once and Jake got off the couch to chase her. She explored all the rooms in the house including testing all the furniture. She is very fond of having the door open so she can go out when she wants to and is already independent and going out frequently to explore all the new animal sights and smells. We have not had the full contingent of deer walk through the back yard yet so it will be interesting to see how she responds to them. She does follow me around and last night jumped on the couch to sit beside me. I rubbed her chest a little and she put her head in my hand. Wow! I was not expecting that and she let me pet her. I just get the feeling that shell be a lap dog soon. She seems a perfect fit and a wonderful addition to the pack. 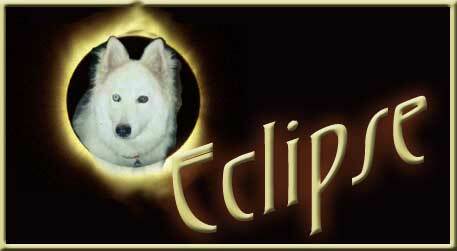 Hello to all my friends a TTOT it’s me Eclipse, I just sending you a note to say hi and that I am doing wonderful. I’ve been here 5 days and it seems like this has always been my home. My boy friend Zephyr (you remember him, he was a TTOT boy too) and I run around and play in the yard most of the day; it’s nice a quite here and there are many things to hunt like birds and deer. I even get the old dogs Jake, Nuk-Nuk, Crystal and Annie to play. I really love my new human mommy I follow her around most of day so she won’t get lost, we also like to naps together on the couch. Friday night my new human daddy came home from his business trip after about 15 minutes and I decide to visit him. He started to rub my ear and wow did I like that! Also just so you know I also made a big decision today (Sunday) I decide I like this petting stuff. I have been watching the rest of the pack and they seem to enjoy it so I figured I would see how it was. My new pack has trained our humans to pet on command. If, you go up to our human mommy and daddy sit down in front of them and paw at them they will pet you. A little while a go tried this with my human mommy and it worked, after about 20 minutes she stopped so I tried it again on my human daddy and it worked again, this is to cool! I must have taken the pack a long time to train our human parents to do this. I wanted to thank all of you (especially Audrey and Karen) for helping me find a new home and for taken such good care of me. I have to go now Zephyr and I have a date to nap under the deck, but I will write you in a few weeks to let you know how I am doing. Hi my name’s Lucy. I just joined the Petro family pack. Wow! 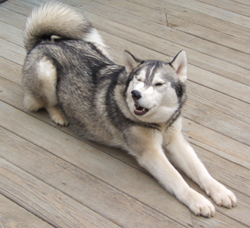 I’ve never been around so many huskies; they have 5 other husky rescues besides me. I was a little scared at first, so my mom has been easing me into meeting everyone off leash. She made it clear that when I’m in the house I have to be in my crate for at least the first month. I tend to run around like a crazy puppy (I’m only 6 ½ months), then I get everyone over excited BUT we have to behave when we’re ALL indoors. They wanted someone like me as a playmate for Emma their 1 ½ year old female. She was driving everyone in the pack nuts wanting to play all the time. She’s kind of bossy and has strong alpha characteristics and the pack wants her to be that way since the group rarely corrects her. I heard through the grapevine that she got away with murder being the youngest. I’m a little submissive so I’m a good fit for her. We bonded IMMEDIATELY! As a matter of fact, she got in between me and the other dogs during introductions just to be sure no one would hurt me. She’s very watchful how they play with me, not too rough. 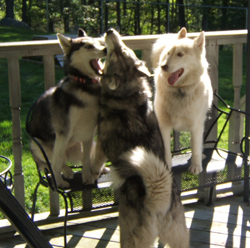 We play all the time now, we run top speed all over the yard and then play hide and seek under the deck. That’s my favorite game so far. 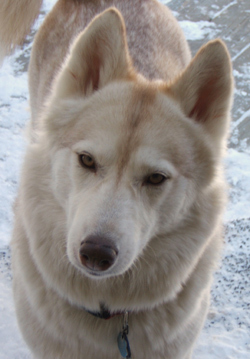 Next I got to meet Eclipse (Female-7 ½ yrs), who’s very shy with people but extremely dog savvy. She was Emma’s mother in the pack and trained her to be a gentle loving dog, just like Emma is training me now. We bonded immediately too. If Emma has a question she always asks Eclipse what to do and how to handle the situation. But Eclipse gives me gentle corrections too and she’s a great teacher. I thought I knew a lot about digging, but Eclipse is a master digger and she has shown me the where & why to more digging. She also spends much time roaming up and down the fence. I roam with her but so far I don’t know why we’re doing it. Sometimes all the dogs are in one spot actively watching the grass on the other side. I join in but am clueless. Mom says during the summer there’s great hunting there: rabbits, chipmunks, voles, mice even snakes stroll down the fence. They make one mistake and well, they could be dinner. I’ve been watching Emma and apparently NOTHING is allowed to land in the yard. She runs top speed to chase every bird that lands, even if it’s just resting on the fence it has to go. Actually, she chases every flying creature: bees, moths, wasps, dragonflies, butterflies, bugs of every type, EVERYTHING! Once you get them they’re fun to eat! The three of us make a great play group together. Actually, I was allowed out with all 3 other girls; we took to each other immediately. Next I met Crystal (12 yrs). She’s like my great grandmother. She’s very friendly but doesn’t like to run around much. She has a space quirk, when she’s resting she claims a large circle around herself and she DOES NOT APPRECIATE me running through that space, so I have to get use to that, sometimes I forget and she reminds me of the proper boundaries. She hangs out with mom all the time. I follow her around the yard when she’s out and she taught me how to select grass clumps for grazing. Apparently, after the grass is cut the clippings sometimes clump if the grass was tall enough. Some are just perfect for chewing and she is showing me how to select the appropriate ones. WHO KNEW there was a culinary side to grass! I started meeting Quasik (5 yrs) the youngest male only on the deck. He gets too excited in open space and just tackles me. But it’s been 2 weeks now and he’s much better. I’ve been playing with him on the deck by myself and I’ve adjusted to how he plays. Then mom started changing the play groups, sometimes it’s me, Emma & Eclipse, then it would be me, Quasik & Eclipse, other times it’s me, Emma and Quasik. Crystal comes out all the time but she just sits and observes. Quasik also is a master digger, he likes deep holes in the middle of the yard (grubs, yummy) and he’s likes to just rip out grass roots toss them in the air and chase them. He’s also an excellent stalker. When he first did it I was terrified, then I realized he was playing. But I’ve been watching him closely and that’s how we’re supposed to sneak up and hunt things. When I first got here I was the est dog. Now after only 2 weeks I’m already bigger than Quasik and almost as tall as Emma. Actually my back end is higher than my front end, guess I’m going through a growth spurt. They actually had to get a bigger crate for me because when I sit up straight my head was 1 ½ inches above the top of the other crate. Now I stretch out in every direction as far as I can go. Poor Quasik, he has a Napoleon complex, I think he thought he was FINALLY going to have someone to boss around and now I’m bigger than him. Emma won’t let him boss me around; of course, she lets him know that he can’t boss her around either. 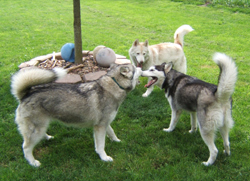 Just this week we started having 4 active dogs in the play group: me, Emma, Eclipse & Quasik. I’m taking the longest time getting use to their huge wooly alpha male Zephyr (8 yrs). He has very few social skills; he’s very loving and sweet but has no idea how to meet another dog even though he genuinely likes other dogs. He’s SO BIG he scares me and he likes to play bow with a ferocious bark. Mom says he’s trying to initiate play but I’m not convinced, so I’m biding my time getting to know him better. Sometimes, me, Zephyr and Eclipse are out together and I just walk with him. That’s really nice and I feel safe. I’m afraid when we’re all running; I hide under the deck until Zephyr calms down, and then I play with him just a little. Mom assures me he wouldn’t hurt a thing. They have a hinged screened dog door. At first I couldn’t figure out how to go in and out. I’d poke my nose in the corner and try to open it toward me and get stuck. Then I only went through when one of the others was going in or out. But, I finally figured out how to push it open for myself which is a good thing cause you know the famous husky saying “Whatever side of the door a husky is on is ALWAYS the wrong side”. Mom & Dad (and the other dogs) seem very happy that I’m here, especially since Emma is very tired now, so everyone is getting more rest. Since we’re all tired in the evenings I’m allowed out of the crate and getting to take a look around the house as long as I’m not running! I’m starting to learn that I don’t need to run constantly-I get plenty of exercise-so I have actually begun to sit quietly among the group both inside and out and just rest. It doesn’t usually last long but it’s a start. They‘re also trying to teach me NOT TO BE a morning dog. We all go potty at 5 am but the rest of the dogs go back to sleep and they DO NOT LIKE TO BE BOTHERED UNTIL AROUND 7:30 am. I’m struggling with that one, but I know when we start running we go top speed for at least 45 minutes. Mom actually has to call me in to rest in the crate because I’m just a puppy and I’ll run until I drop because I don’t know any better. I use to be a picky eater but now I eat all my food – I watched the other dogs the first few days and they ate their food right away so I just followed their lead. I’ve learned to love treats. I get a dog bone after dinner and twice a week we all get a pig ear. It takes me forever to eat it but I love them. I’ve learned that unless I eat all the food in my dish, I don’t get to eat desert. (I’d rather have desert first, wouldn’t everyone?) Mom says I’m a bright little girl just like Crystal, always thinking things through. She says she’s not sure yet whether that’s a curse or a blessing! I’m also going through a chewing phase. Apparently, I’m not supposed to chew up my collars but I’ve gone through 2 of them already and gnawed on some of the woodwork. There’s a nyla-bone in my crate but sometimes I just like to explore other textures, including humans. They tell me not to do that and I’m learning not to jump up on people. I just noticed this morning that the deck is made entirely of WOOD. I LOVE WOOD! Mom says she wishes they had a stone patio. She said she is going to watch me like a hawk outside. So much to learn & I have a big family to teach me! I joined in on my first husky group howl the other day. We all harmonize so well together, maybe we should do a record or something because it’s mesmerizing. We could put together a “meditation” CD with husky sounds, maybe some flute, drumming and running water and sounds from a night in the woods. The neighbors would probably appreciate that I’m sure.